We’ve talked a bit about LinkedIn recently, as they have been making strides. 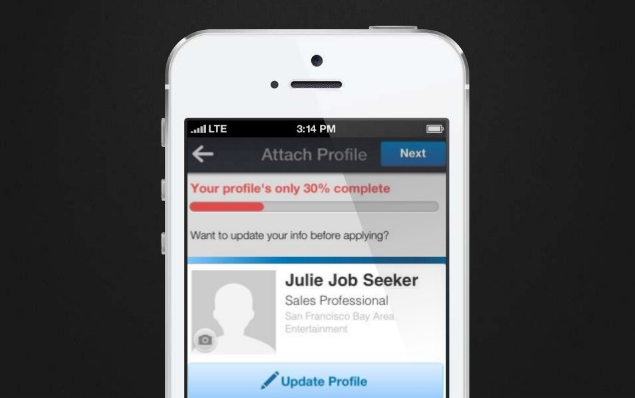 Now the business social network will allow you to apply for jobs on your mobile phone. The company have updated their smartphone app again, brining a number of new features which are intended to help you to apply for jobs on the go. The update is coming through today (Monday). See also: Are Facebook planning to take on LinkedIn in 2013? LinkedIn, not unlike other social networks like Facebook and Twitter see a vast proportion of their visitors coming on mobile devices, and this is growing all of the time. According to the company, over 30 percent of their visitors are now coming in via mobile devices. “Over 30% of members who view jobs on LinkedIn come from mobile,” said Vaibhav Goel, associate product manager at LinkedIn. LinkedIn has grown up around jobs. From it’s very earliest days, it became a favoured platform for recruiters and headhunters. The ‘jobs you may be interested in’ is one of the most visited sections on the LinkedIn website. Last month, LinkedIn rolled this function out onto their mobile app for the first time – and it produced a surprising result. Many mobile users viewed this section of the app, which was expected. What was less expected was the fact that many of these users had never visited the jobs section on LinkedIn.com. Very quickly this has thus opened up a whole new mobile opportunity for LinkedIn, and they have acted quickly to expand the opportunity further. So the new update does just that. Where before you could browse jobs, now a big ‘Apply’ button has appeared. You can also quickly shortlist jobs by saving them. once you choose to apply for a job, the app prompts you to update your profile. Side note: if you’re between jobs, check out our article about the 11 must use tips to leverage LinkedIn to find your next job. One key part of your profile that you will want to change quickly is the contact information – you don’t want potential approaches being sent to an old company email address that you may no longer have access to. We cover a host of similar points for you to consider in the article. Ready to be a pioneer and make a mobile job application on LinkedIn? The app update comes to english speaking countries first and will then systematically roll out to all other LinkedIn members after that. Is this a game changer for mobile based recruitment? Let us know your thoughts in the comments.